Setting to music “the most famous camping trip in history,” Two Yosemites recreates the remarkable 1903 meeting between President Theodore Roosevelt and famous conservationist John Muir. 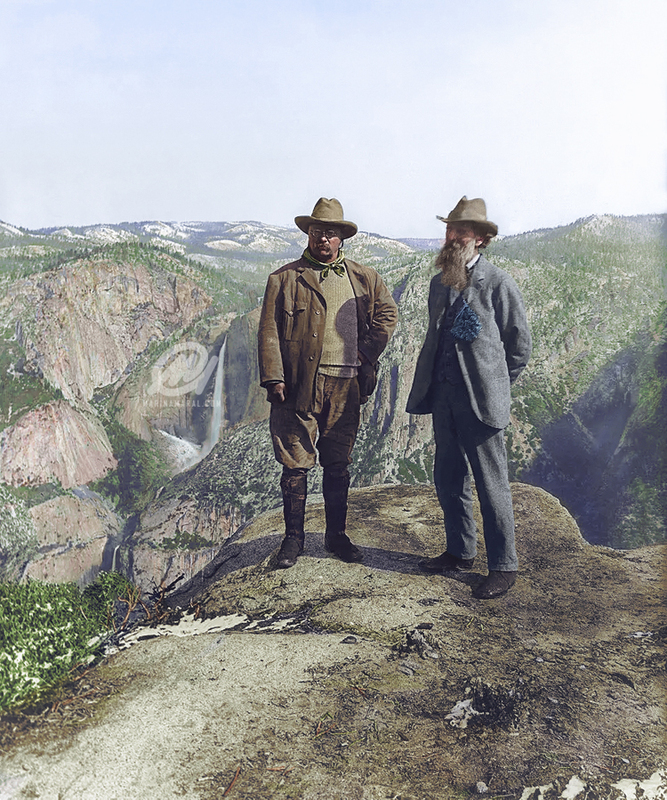 President Theodore Roosevelt (left) poses with John Muir at the top of Glacier Point, Yosemite in 1903 (Image colorized by Marina Amaral and used with express permission). THE OPERA sets to music the meeting between President Theodore Roosevelt and conservationist John Muir on their historic, 1903 camping trip in Yosemite National Park. Arguably the most famous camping trip in history, it marked a pivotal moment in the emergent American Conservation movement to save and protect lands and wildlife from the exploitative impulses of the 19th and 20th Centuries. The two men shared much in common, however, where they diverged illuminated vastly different visions of our relationship with our environment. The drama takes place over the course of one evening, around the campfire at Glacier Point, yet within this setting, the archetypes of their concerns and experience, ultimately, express our own. We embark on this journey with them; their words speak across time to the perennial engagement of our own consciousness. During his presidency, Theodore Roosevelt signed into existence five national parks, 18 national monuments, 55 national bird sanctuaries and wildlife refuges, and 150 national forests. Two Yosemites tells the story of two powerful, eccentric, and passionate figures, whose meeting illuminates the debate of conservation, democracy, and the relationship of society with nature. It is a story of love and sacrifice and the fate of a long lost valley whose name became a rallying cry and a century of controversy. Learn more about the opera here. For sponsorship opportunities at any level contact Lisa Lipton at lisa.lipton@operatheateroregon.com, or for individual donations visit our DONATE page.